Notes on Auckland Libraries, Sir George Grey Special Collections, Med. MS G.132: St Gregory the Great, Moralia in Job, English, second half of the twelfth century – by Alexandra Barratt and Alexandra Gillespie. The notes and images below supplement our account of the book in our essay, “Early Bindings on Medieval Manuscripts in New Zealand Libraries” forthcoming in the journal Script and Print. 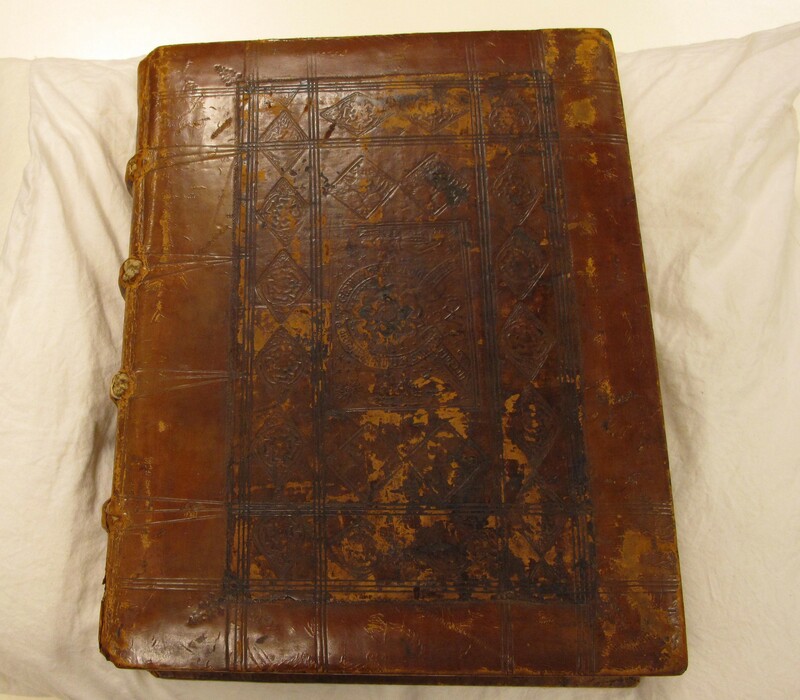 The boards and part of an early Tudor (sixteenth-century) calf cover from a medieval binding of this book have been reused in its post-medieval rebinding. The section of the medieval cover on the upper board has been decorated with a panel in which the Tudor rose is surrounded by an inscribed scroll supported by angels (see figure 1); on the lower board the cover is decorated with with a large, initialed, heraldic blind panel of the Tudor royal arms supported by a griffin and a hound (see figure 2). The binder also used a pattern of blind rules and stamps (Tudor roses and a pelican in her piety, set in lozenges). The binder who decorated his tanned covers this way is known only as “H.N.”: J. Basil Oldham’s catalogue of English blind panels of the fifteenth and sixteenth centuries notices eight books that bear either this heraldic panel (He. 28), or this “rose” panel (Ro. 20) along with his initials. His location and active dates are uncertain; all but two of these books are medieval manuscripts that he rebound: Oldham describes two printed books dated 1519 and 1535, but observes that they could have been bound later in the sixteenth century. 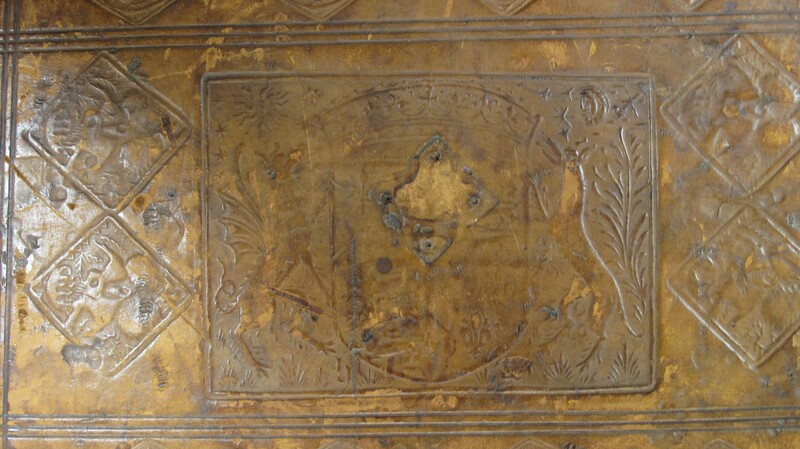 It was probably only because of the presence of the royal arms that any part of the binding on G.132 was saved. David Taylor, following earlier cataloguers who misread “h n” as “h u,” perpetuated the idea that the manuscript had belonged to Henry V,  even though this had been discredited by Sir Frederic Madden “as early as 1836.” This is the only panel-stamped binding on a medieval manuscript in New Zealand, although the Alexander Turnbull Library has a sixteenth-century English panel-stamped binding on a printed book, Proverbes, ecclesiastes or preacher (London: Richarde Jugge, 1550?). The binding of G.132 is partly of interest because it is a pair with another surviving book, Oxford, Bodleian MS Rawlinson C. 435. This is a twelfth-century copy of the first part of Gregory’s Moralia made earlier than the Auckland copy, but linked to it by scribal work: there are matching running and fore-edge titles in the same textualis script and same hand in both books (see figure 3). The books appear to have had the kind of continuous institutional history—stored and treated together for at least three hundred years—that only the medieval religious could provide. The Bodleian copy reached the book market in the sixteenth-century (when it was priced “iiili. xvis. viii’” on a fly leaf). The decoration of the cover links the book directly to technological changes associated with printing. Panel stamps are known before the fifteenth century in the Low Countries, Antwerp, and Cologne, but it was the invention of printing that, Staffan Fogelmark explains, “saw the great breakthrough for the Flemish panel stamp, which was then adapted to meet commercial needs that had not before existed.” Whereas metal stamps could be applied by hand, the metal dies of panels were too large to leave a satisfactory impression this way; the binder had to use a press. Their advantage was speed. They could be used to cover a large surface area—in the case of small books, all of the cover on each face of the board—much faster than individually applied stamps and rules. The context for the development of panel stamping was thus the unprecedented increase in levels of book production that was a result of printing. Once the fashion was established, however, panels were used for other reasons. G.132 is not a small book, and the “H.N.” binder may have saved some time by using his panels, but he made use of a complex arrangement of stamps and rules as well. 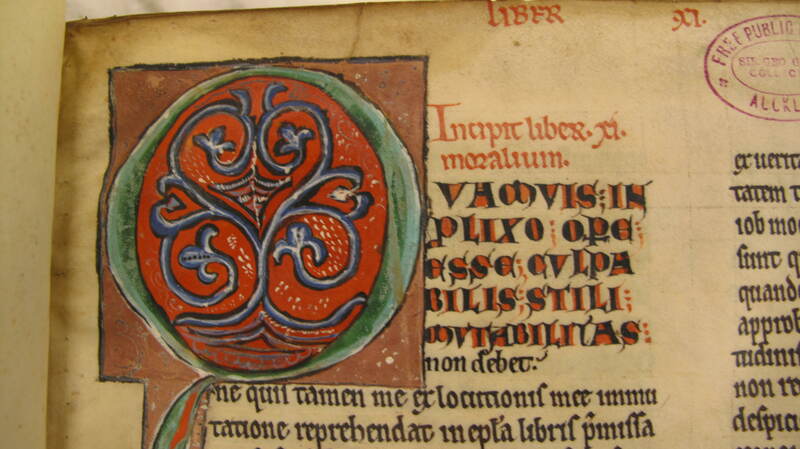 The book is not printed, but like others this binder worked on, a medieval manuscript. It was almost certainly bound to bespoke orders sent by the institution to which it and Rawl C. 435 belonged, rather than bound “speculatively,” ahead of sale, as were many printed book in the early Tudor period. Both books were quite elaborately furnished: the binder supplied fastenings and brass bosses. 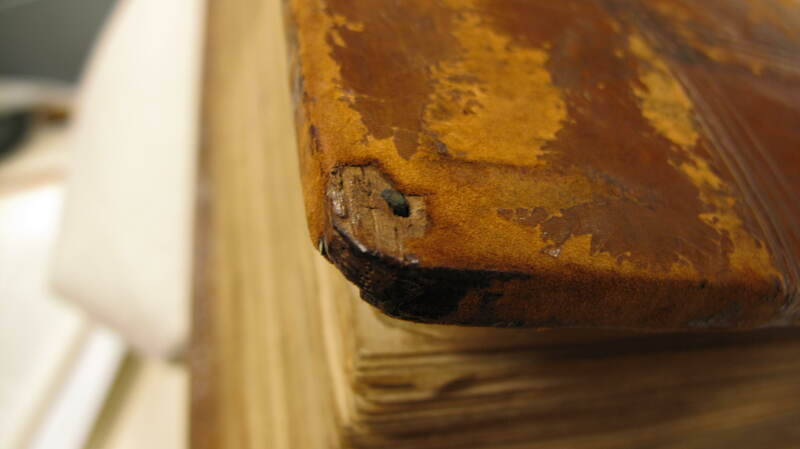 Only indentations, nail holes, and some nails (see figures 2 and 4) remain in the cover and boards of G.132 from these furnishings, but five of the bosses themselves and the two plates that anchored the fastening strap to the upper cover of Rawl C. 35 survive. Rawl. C. 35 shows another feature probably lost in the rebinding of G.132: the binder used as fly leaves two bifolia that we have identified as from a thirteenth-century glossed and rubricated English copy of Digesta Justiniani (from the Corpus Juris Civilis issued by Justinian I). 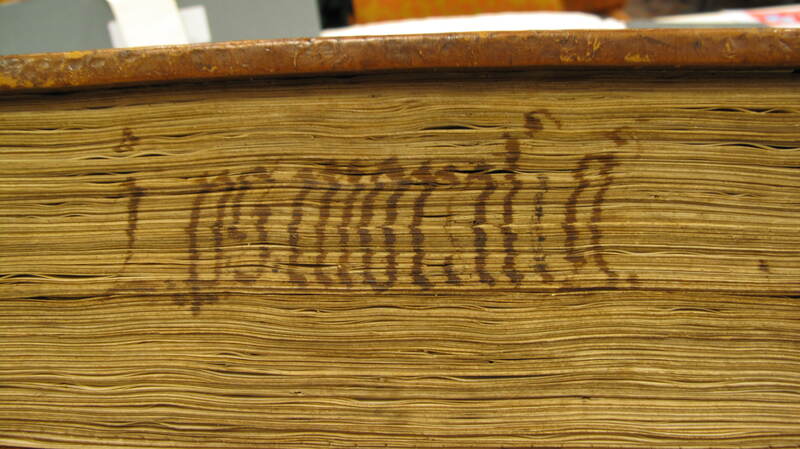 These show no signs of previous wear from another binding: presumably they were part of the “H.N.” binder’s own stock. For a full description of this manuscript including its binding see Margaret M. Manion, Vera F. Vines, and Christopher de Hamel, Medieval and Renaissance Manuscripts in New Zealand Collections (Melbourne, London and New York: Thames and Hudson, 1989), no. 12; our work repeats key details from and then supplements their account. See also Donald Kerr, Amassing Treasures for All Times (New Castle, DE, and Dunedin: Oak Knoll and University of Otago Press, 2006), 171, 214. On the illustrations, see Rodney M. Thomson, ‘‘Minor Manuscript Decoration from the West of England in the Twelfth Century,” in Reading Texts and Images: Essays on Medieval and Renaissance Art and Patronage, ed. Bernard M. Muir (Exeter: University of Exeter Press, 2002), 26, no. 24. See Manion, Vines, and de Hamel, Medieval and Renaissance Manuscripts in New Zealand Collections, 50. J. Basil Oldham, Blind Panels of English Binders (Cambridge: Cambridge University Press, 1958), 35. David Taylor, The Oldest Manuscripts in New Zealand (Wellington: New Zealand Council for Educational Research, 1955), 100. Quoted from Manion, Vines and de Hamel, Medieval and Renaissance Manuscripts in New Zealand Collections, 50. Alexander Turnbull Library Howard 19; “Simple to Sumptuous: Bookbindings 1450 to the present,” accessed 30 August 2012, http://www.natlib.govt.nz/collections/online-exhibitions/simple-to-sumptuous. As was first noted by J. A. W. Bennett, “A Medieval Manuscript in New Zealand,” Bodleian Library Record V (1954-6), 25-7. Flemish and Related Panel-Stamped Bindings: Evidence and Principles (New York: Bibliographical Society of America, 1990, 2. Gillespie, “Bookbinding and Early Printing in England,” in A Companion to the Early Printed Book in Britain 1476 to 1558 (Woodbridge: Boydell, forthcoming 2013).